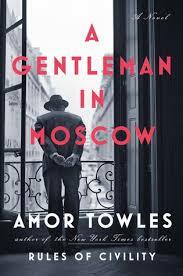 a book chick: "A Gentleman in Moscow"
my take: Wow. Wow. Wow. I had really high expectations for this book based on my love of the author's previous novel. And in an era where disappointment is running high for me ... it was lovely to be out-expected. Count Alexander Rostov inhabits the Metropol Hotel in Moscow. Never mind he is under house arrest and will never leave. He inhabits it fully. Through him we meet the staff, the rising stars of the State, the international visitors; peek into suites, closets, attics and basements; and enjoy meals and wines in the restaurants and bars. "As we age, we are bound to find comfort from the notion that it takes generations for a way of life to fade. We are familiar with the songs our grandparents favored, after all, even though we never danced to them ourselves. At festive holidays, the recipes we pull from the drawer are routinely decades old, and in some cases even written in the hand of a a relative long since dead. And the objects in our homes? The oriental coffee tables and well-worn desks that have been handed down from generation to generation? Despite being 'out of fashion,' not only do they add beauty to our daily lives, they lend material credibility to our presumption that the passing of an era will be glacial. But under certain circumstances, the Count finally acknowledged, this process can occur in the comparative blink of an eye. Popular upheaval, political turmoil, industrial progress--any combination of these can cause the evolution of a society to leapfrog generations, sweeping aside aspects of the past that might otherwise have lingered for decades. And this must be especially so, when those with newfound power are men who distrust any from of hesitation or nuance, and who prize self-assurance above all. I could quote so many passages for their insight and beauty. With 462 pages, there are plenty of options. Playful, witty, grand, cautionary, celebratory ... loved. this. book. my source: Gifted for Christmas ... on my wanted list ever since publication date. Amor Towles Rules of Civility was a top pick a couple years ago. my verdict: Excellent. Top notch. Five stars. I laughed, I nearly cried, I came away a better person. In an era where disappointment is running high... don't we know it! This one is so different from Rules of Civility but just as excellently written I think. I loved inhabiting the Count's world for that many pages - and was sad to leave! Looking forward to borrowing it- what with the highest of praise "I laughed, I nearly cried, I came away a better person."